IMPORTANT: If you are a new Kiteboarder, you need to take lessons with a professional kiteboard instructor. If you show up to the Sandbar without proper knowledge and experience of how to kiteboard safely, you will be asked to leave. Please respect the safety of kiteboarders and other users. Secure your kite with extra sand when rigging your lines. Keep your kite under control when you launch and give others kiters as much space as possible as you leave the launch and biginer area. Please allow others safe access to the river by kiting somewhere other than at the the launch and biginer area. 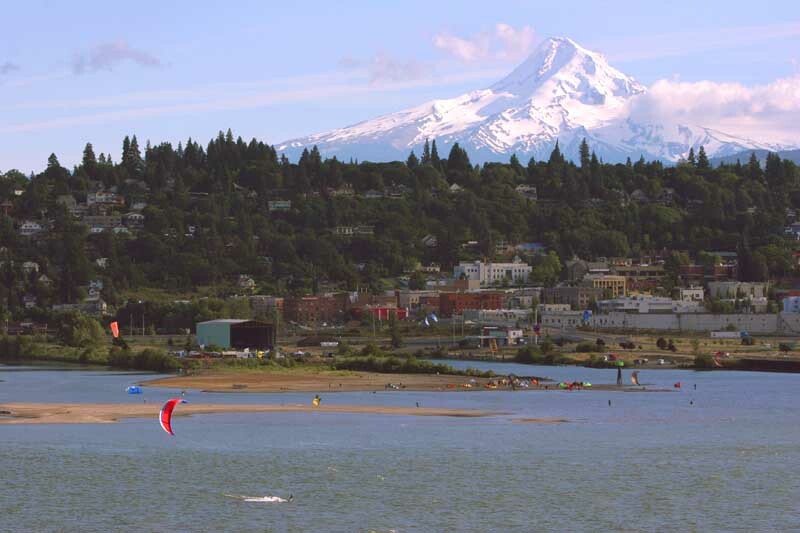 For information on lessons contact one of the local Hood River shops or schools: Gorge Kiteboard School, Brian's Windsurfing, Kite The Gorge, Hood River WaterPlay, New Wind or Cascade Kiteboarding . Looking for decent free forecasting and sensor resources for the Columbia River Gorge? Take a look at our Forecast Page. 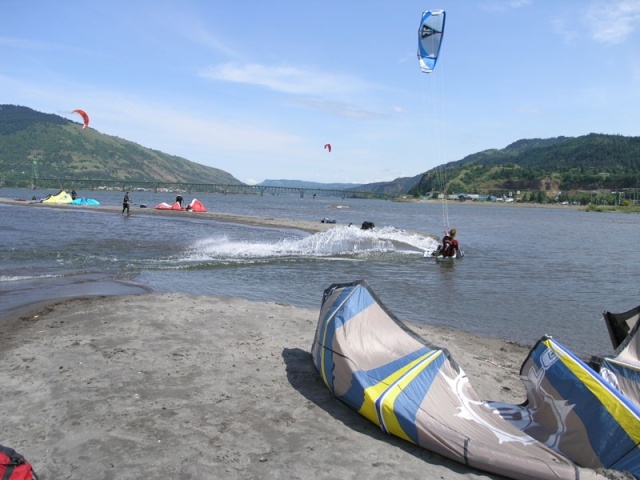 The Hood River Sandbar is the only sandy kiteboarding launch in the Gorge, it is also one of the most consistently windy spots in the entire country. It's the spot where the Gorge schools call home, so if you are looking to learn to kiteboard look no further. - You are unlikely to see conditions in the Northwest more crowded than the sandbar on a hot weekend afternoon. To make it bearable for everyone try to minimize your own presence on land. - Beware when on the sandbar kites will be launched, landed, and flown directly upwind of you. It is always advisable to keep an eye upwind to make sure an out of control kite isn't rolling towards you. For this reason, it's not the best place to bring kids, the wife, grandma, etc..
- The wind is gusty in the gorge, when you launch, keep your kite low and go to the water. If you park your kite at 12:00 it will lift you, or fly over your head onto slack lines, and then it will power up and endanger you and everyone else on the beach. - When standing around, keep your kite low (below 10:30 or 1:30) to allow other kiters to pass up wind and avoid getting lifted. - Once you launch, ride upwind and away from the bar to avoid people launching and landing and newbies learning in the shallows. - Remember when riding downwind of other riders to keep your kite low, when riding upwind of other riders keep your kite high. - The Hood River portion of the sandbar is a dangerous place to ride, and is normally where the pros roam. If you ride there please be mindful to share. Someone winding up for a big trick right in front of a camera on the point will not be happy if you ruin it for them by riding in their path. - There are strong currents in the area where the Columbia and Hood Rivers converge (Black Hole 1). It is especially easy to get stuck down here and not able to get back upwind because of the currents. If you get stuck, make sure you know how to self rescue properly, and don't be afraid to end up on the Washington side if you need to. - Watch for barges in the channel, they come often. - There is more space to ride and steadier winds upwind from the launch. If the wind gets light it's easier to return to the sandbar from upwind. - Landing your jump just upwind of people on the sandbar is not considered cool, especially when you lose it. Hood River Oregon is located 60 miles east of Portland on I84. There are three points of access to the river. Take Exit 63. Turn off the freeway ramp towards the river. You will see the Event Site directly between the freeway ramp and the river. Go right at the first stop sign and left at the second stop sign. The eastern end of the grass is available for kiteboarders to pump up kites before walking over to the sandbar to attach lines and launch, and for drying and packing up when you are done kiteboarding. Launching and landing from the Event Site, or riding inside the caution/safety zone is prohibited from May 1st - Oct 1st. Any launching, landing from the grass or riding inside the caution/safety zone by kiteboarders will jeopardize our current privileges and any future opportunities, so please follow the rules that have been agreed upon for kiteboarders to use this location. At high water levels you will need to swim to get to the sandbar and some kiters go for the easier access from The Spit. If you are unfamiliar with the rules, please refer to one of the information map/signs installed at the upper section of the Event Site lawn near the sidewalk. Event Site grass is open to launching from Oct 1 till May 1 only. The Event Site beach is an expert only launch area, beginners and intermediates should launch from the Sandbar so as to avoid any accidents or damaged gear. Please use only the eastern end of the grass. - Please launch kites from the Event Site only east of the Bathrooms for safety and courtesy and only between Oct 1 and May 1. - When you set your kitelines up on the grass only do so when you are ready to launch so as to avoid traffic jams. - Ditto on landing. When you land your kite, clean up your lines by coiling them up on your bar and moving your kite to the upper section of the grass hillside. - When you launch, do it by positioning yourself in the water as far from the beach as possible. - Avoid standing in one place with your kite at 12 o'clock. Get in or get out. All of the injuries at the Event Site (which caused the original closure) were the result of kites lofting people standing on the beach. - Please keep the trick shows at decent distance from the beach and give courtesy to the windsurfers and kiters trying to launch or land. Take Exit 63. Turn off the freeway ramp towards the river. You will see The Spit off to the right. Go right at the first stop sign and right at the second stop sign. You will be headed towards the 76 Gas Station. Turn right a third time just before the gas station and go around the back. Continue down the small road until it turns left onto a gravel road at the pedestrian bridge. This is the original kiteboarding access to the river. You can walk out the sandbar without swimming in high water and without getting wet at normal water levels. Take Exit 64. Turn towards the river as you come off the ramp. Go left at the first intersection after the westbound freeway entrance and then go straight through the first intersection as you enter the Port property. Keep circling around to the left of the harbor until you get to the beach. 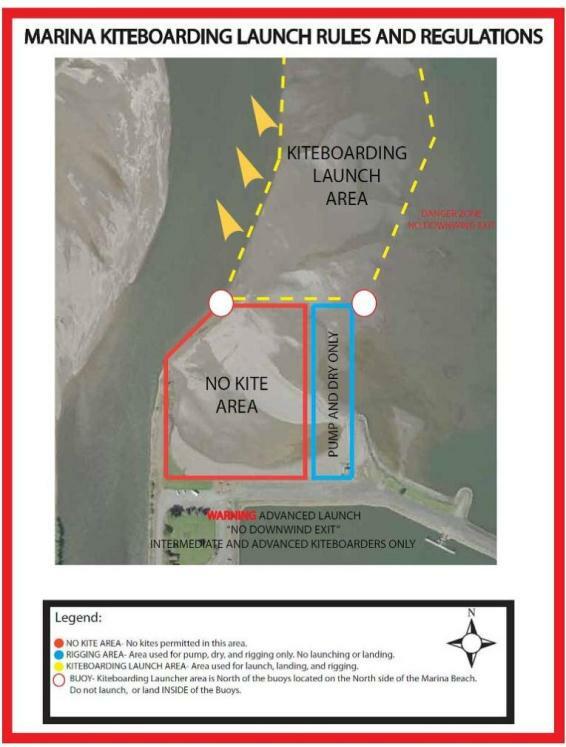 The Marina launch should be used only by skilled kiteboarders because there is no safe landing area downwind on the Oregon Side of the river. If the wind drops suddenly experienced kiteboarders are also out of luck. The river current and wind will push underpowered kiters (and self rescuing kiters) under the bridge or to Washington. 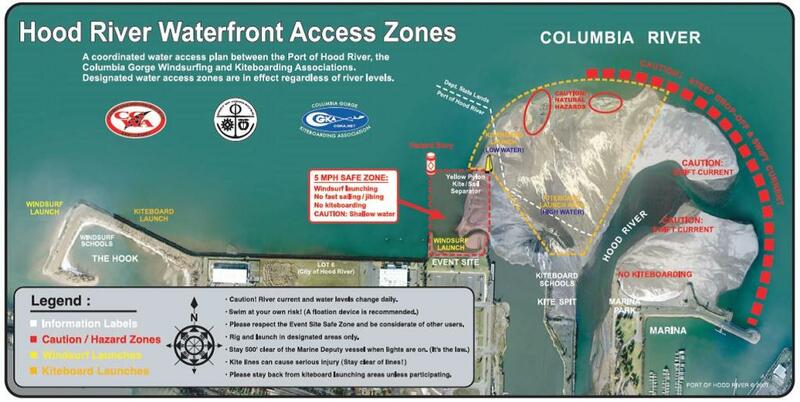 The strong currents of the Columbia make the bridge pilings extremely dangerous for kiteboarders. If you are getting forced toward the bridge go for the cove 300 yards downstream of the bridge on the Washington side instead of drifting under the bridge. When you launch at the marina, you might want to kite upwind to get to a spot with steadier wind and a higher chance of returning to Oregon if the wind quits or switches to south west. Hood River offers some challenge in the sheer number of riders on the water, always be mindful of your surroundings. 1) Below Hood River/Second sand bar area there is a large area where wind is shifty and it is difficult to stay upwind. You will not get an apparent wind effect from the current in this area because it is neutral or pushing downwind. Check the map for "Black Hole Area #1." Self rescuing in this area is also difficult to impossible, due to the outward current from Hood River. If you are attempting to self rescue into that current, you will make little or no progress. Instead consider dragging back out into the main channel and let yourself drift downriver (upwind) until you are past where Hood River comes out, then attempt to drag in again. 2) Close to Washington edge of river (maybe within 100-200ft of the wall) the wind can often shut off completely causing your kite to fall from the sky (even when its blowing 20 knots in the channel.) Check the map above for "Black Hole Area #2." Pros will be pros, keep an eye out. - Event site sensor on IWindsurf is what you want to watch. - Wind can be blowing as early as 10am, so head to beach early to avoid the crowds. - Winds usually shut down or at least start tapering 2-3 hours before sunset. - The best wind and open water can usually be found far upwind of the sand bar. "Kiting below the sand bar island is like going into a black hole, it's hard to get out of it once your in it. The wind is shadowed from Wells Island upwind and a back eddy exists at the tail end of this island from the Hood River draining into the Columbia. It is really hard to relaunch your kite in this area with the forces imposed upon the kite. I've seen many newbies tire to the point of needing help from others and or dumping their kite and swimming into shore. Second, if one wants to go up wind with greater ease where there are less people and better quality wind, tack back and forth in the shipping channel (it increases your apparent wind speed). This is defined by the buoys and the swell. One knows they are out of the channel on the Washington side when the swell gets small and or is nonexistent. This is where another back eddy exists and your rather close to the rocky shore. Barges typically like to stay in the middle of the channel and when you see one you should get out of the channel and wait for it to go by. Mess with shipping commerce ie big $$$$, and we will all feel the pain of its power and might. Lastly, the sand/real estate at the launching and landing point should only be used for launching and landing. When one hinders this access by placing all their stuff there or sets up there, it hurts that functionality of the beach. Please place your gear and do your setup far back from the ever-changing launch and land site (it changes due to water levels which is controlled by the upriver dams). This way we all can maximize our respective time on the water." "Also, right below the very edge of the outer sandbar there is that horrible place where the current of the Hood River meets the current of the Columbia. That is the real black hole and if you get stuck there, you will be stuck you cannot swim outta that hole so watch out for that." "1) The west end of the Marina beach and grass is not a legitimate launching land landing zone and it is super important to be aware of the families utilizing that area. 2) Because of the ever present downwind kite traffic, downwind families, sailboats, barges, bridge, jetties, etc a leash of some sort is mandatory. With the many spinning, 5th line, and suicide leashes available there is no excuse for losing your kite downwind. 3) Its important to be courteous to the windsurfers upwind of the sandbar and keep in mind that like the sandbar, there is a wide range of skills in the windsurfing crowd riding at the event site- many of whom don't really know how to handle a kiteboarder on an opposite tack. Always be ready to yield right of way. 4) I think you handled "better riding upwind" well. It is really a more advanced riding area (more difficult getting rescued if something goes wrong, no good landing spots, much larger swell, frequently higher winds than the sandbar, narrower channel, etc etc) and as such those that can make it up there and be able to ride safely will without directions and hints and those that cant hopefully will stay around the sandbar. 5)Keeping gear on the beach in as small of an area as possible and not leaving lines laid out on the beach- if you aren't actively rigging, launching, or landing lines need to be wrapped up. 6) Be helpful to other riders, give launches, catch kites, know the now well recognized signal for "catch my kite please" (tapping head), know who has right of way on the water." "If you're intermediate/advanced beginner level or simply don't like the hassle of dealing with problems out in the channel, IMHO the best spot to ride is somewhat upwind from most of the windsurfers. The wind is not the most consistent, but you get blown back in to where you took off if something goes not as planned (like the wind picking up from 20mph to 35 in about 5 seconds, which happens). Also, nobody said anything about beginner/lessons area. I think it's both safer and actually quite polite not to be around beginners taking lessons in the shallows. They just get scared and loose it if you ride past them creating trouble for others and not enjoying their time on the water as much as they could. I've seen many a good rider do just that and this is just not nice. Also, the advice about the "black hole area" just downwind from the bar should be in bold imho. It takes just 15 minutes to be swept out into the channel if you go down in cold water. I don't really know of any good way to deal with it, the best seems to be to just give up as soon as possible and walk back from marina. Or wait a little and around the closest buoy try to self-rescue a bit upwind hoping to end up back on the sand bar. And teach your dog not to mess up kite lines. Oh yea, if the wind is below 25 make sure you have a plan for when it picks up to 35 in a few minutes."